We cordially invite you (yes, you!) to join us aboard the luxurious PFB Mediterranean Princess for a once in a lifetime culinary experience. Using never before seen technology, we have devised a way to visit seven Mediterranean countries in just three short hours! Travel with us through the beautiful Mediterranean Sea to Israel, Turkey, Greece, Italy, France, Spain and Morocco, tasting the delicious regional cuisine along the way. Sounds intriguing, no? Well climb on up, grab a glass of wine and a place setting, and let’s set sail! Our next stop is Turkey. Here we have Muhammara, a traditional red pepper and walnut spread. The nutty flavor of toasted walnuts and the sweet but spicy red peppers make this the perfect accompaniment for your pita. I hope you still have some pita left, because we’ve arrived in Greece! And what would a trip to Greece be without some delicious garlicky Tzatziki? This tangy sauce features just the right balance of spice and creamy coolness to counter the hot Mediterranean weather. Mangia! We’ve docked in Italy and have some tasty meatballs for you to try. Smothered in red wine sauce, these meatballs are delicious. But don’t fill up too much… we’re off to France! France is famous for their cheese for good reason. Here we have a delicious round of Baked Apricot Brie. The apricot preserves and crushed almonds are baked right on top of the delicious brie perfectly, for a warm, rich, and gooey treat. Vamos a España! Here in Spain, we are sampling a traditional dish – Tortilla Espanola. This Potato Omelet, made with fresh, simple ingredients, can be found in homes all over the country. It is a true staple of Spanish cuisine. Of course, no meal would be complete without dessert. Today we’re stopping in Morocco for some of their delicious Ghoriba. The chewy Moroccan butter cookies are being offered in two flavors – Cinnamon and Sesame Seed. Wow, that was some whirlwind tour! We certainly had quite the spread! Unfortunately, folks, our tour is coming to an end. The entire crew would like to thank you for choosing to dine aboard the PFB Mediterranean Princess. We hope you enjoyed your experience as much as these guests did! 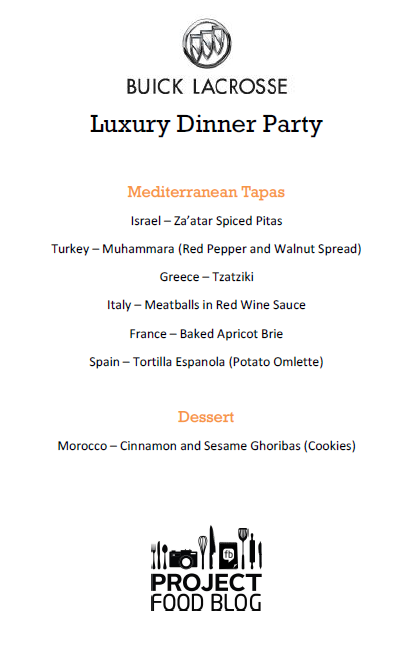 I love this cruising the Mediterranean tapas party! You really selected some great flavors from each country :) I love Muhammara, one of my favorites! Next time I’ll be there! What a delicious spread of Mediterranean foods. I love the cuisine, and it seems like your guests enjoyed every bite! How could they not with you behind the wheel? Thanks for sharing with us, and you will have my vote tomorrow! Excellent looking meal! I would have loved to been there! Good for you! You traveled through all of my favorite countries! I am so impressed with all of the effort you put into this and everything sounds great! I’d hop on board the USS Food For Thought anyday! You’ve got my vote! Wow, bold flavors! That menu is right up my alley. The Baked Apricot Brie is gorgeous. Did you serve it with bread? Crackers? How great is this?!!! I loved your idea of bringing your readers on the trip :) I enjoyed reading and got hungry looking at all of your delicious pictures! Everyone looks like they had a wonderful time :) This is definitely a post to vote for! This is my kind of party! I love it! You’ve got my vote! What a delicious region to do tapas! Everything looks so yummy. Good luck! Oh I want a ticket on this food trip please, love Muhammara. Awesome dinner and see you in round 4…voted! What a great concept! Everything looks fantastic! Best of luck this round. Sounds like a wonderful dinner. What a treat for your guests! I love the cruise idea, tasting cuisine from different countries is a delicious way to spend a night! Sending a big red heart your way – Good luck. Your dinner party looks like it was a hit! Hope we both make it to the next round! :-) You have my vote! Great post! Looks like quite a spread. Nicely done. I voted for you! 100% voted for you. Good luck. Lovely party, Mediterranean foods are always delicious options. Loved the Muhammara idea, I think Turkish food is so flavorful. Good luck in this round, you sure got my vote. I love your theme, and cruises are so much fun. Always want to take a Mediterranean cruise, thanks for taking me. You got my vote and good luck! this looks all so good – a lot of my favorite flavors and some I need to make a favorite – you get my vote and my tweet – good luck! What a fun idea – I’ve never taken a cruise but now I want to go on one! Well, specifically I want to go on yours and eat this menu. How do I buy a ticket?? Good luck in PFB! Wonderful dinner party, and I love how you touched on so many cuisines from the Mediterranean regions and flavors.